Explanation: What is that streaking across the sky? A bright earthgrazing meteor. In 1972, an unusually bright meteor from space was witnessed bouncing off Earth's atmosphere, much like a skipping stone can bounce off of a calm lake. The impressive event lasted several seconds, was visible in daylight, and reportedly visible all the way from Utah, <a href="https://www.cia.gov/library/publications/the-world-factbook/geos/us.html">USA to Alberta, Canada. 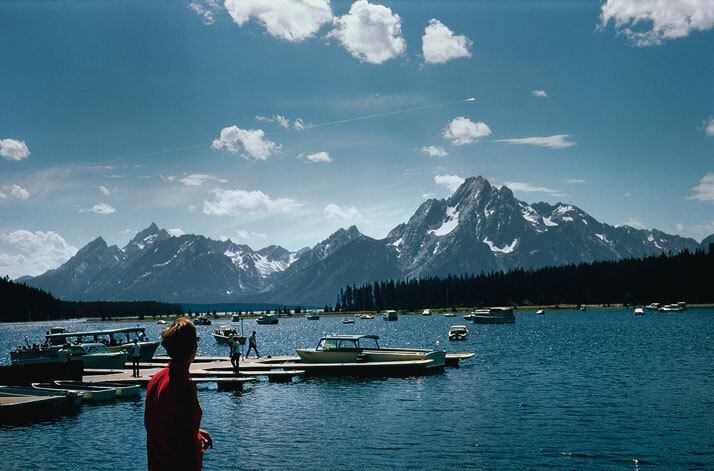 Pictured above, the fireball was photographed streaking above Teton mountains behind Jackson Lake, Wyoming, USA. The Great Daylight Fireball of 1972 was possibly the size of a small truck, and would likely have created an impressive airburst were it to have struck Earth more directly. Earthgrazing meteors are rare but are more commonly seen when the radiant of a meteor shower is just rising or setting. At that time, meteors closer to the Earth than earthgrazers would more usually strike the Earth near the horizon, while meteors further than earthgrazers would miss the Earth entirely.